When KLAS first began coverage of the health information exchange market in 2010, great expectations and good intentions created a mass of positive energy. Grants were given, public HIEs were formed, and a crowd of vendors brought products to market. Today, grants are exhausted, public HIEs are struggling, and vendors are trying to deliver long-term value. Through 257 interviews with 219 providers, KLAS examines the current state of the HIE market and the search for reliability, relevance, and transformation. Most vendors continue to experience flat or falling performance scores from customers as demands outpace delivery. Three out of the four lowest-ranked vendors are industry veterans with high name recognition and market share: Medicity, Optum, and RelayHealth. 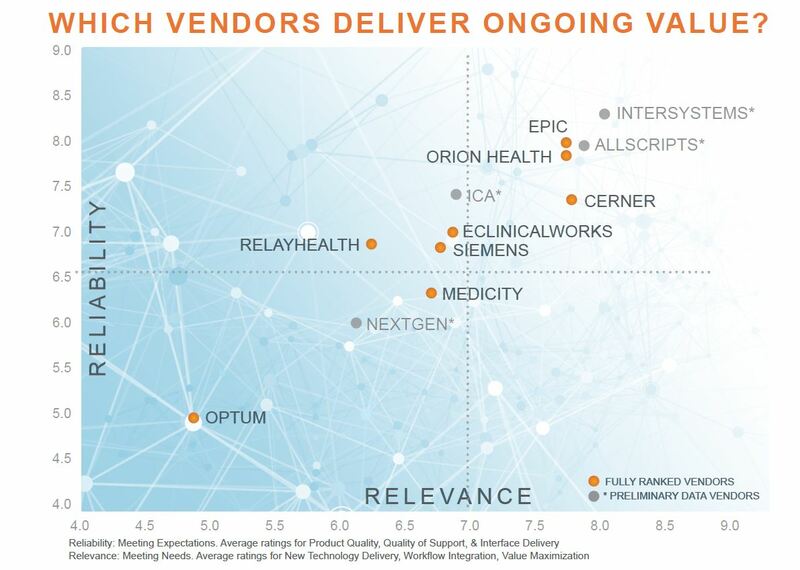 Strong technology and service place Epic and Orion Health at the top of ranked vendors and elevate Allscripts and InterSystems in early results. In terms of HIE market share, EMR vendors may be ringing up the most sales due to relationships, price, and convenience. Nonetheless, vendors with EMR-agnostic solutions, including Allscripts, ICA, InterSystems, Siemens, and Orion Health, are making headway in the strength of their technology—a value proposition that was otherwise fading. Allscripts made headlines with its 2013 acquisition of dbMotion. Providers say that move has been a win, but Allscripts is treading a path that has proven to be treacherous for other vendors. Previous acquisitions of Medicity (Aetna), Axolotl (Optum), and MobileMD (Siemens) have resulted in plummeting performance as customers have experienced disruptions in service and product development. HIE vendors have invested millions to add functionality to help them stay relevant in the future of accountable care and payment reform. Allscripts, InterSystems, and Optum currently have a head start, but overall adoption of and satisfaction with HIE-based analytics and patient engagement are moderate to low. Some providers hope to leverage these pieces yet, but many will likely delay doing so until vendors finally meet expectations for basic data exchange. Rapid adoption by Cerner customers. Integrated with Cerner EMRs but said to connect with others as well. Valued as a partner. Could improve handling of non-Cerner data. Patient portal and analytics not part of HIE solution. Mainly used for sharing data among instances of eCW but also draws from other EMRs. Service responsiveness inconsistent. Analytics not included. Top-ranked HIE. Primarily used to share between Epic providers but in early stages of sharing with other vendors. High confidence in ongoing development. Good clinical adoption despite lack in functionality. Early leader, but scores falling since Aetna acquisition, though stabilizing now. Decline in service a sore point. Development delays hinder technical improvements. Performance drop of 25 points in last two years. Lack of progress in replacing outdated underpinnings of original Axolotl product. Poor service and interface delivery. Optum acquisition blamed. HIE 2.0 upgrade awaited, but most would not buy again. Ranked second in KLAS performance. Continued success in public HIE market. Good technology at more affordable price. Responsive to changes in industry, customer needs. KLAS performance up four points in 2013. Reputation for high cost, especially around interfaces. Customers value RelayHealth’s focus on patient engagement. Ranked third despite 10-point drop in 2013. Slowdown in service, interface delivery, and product development attributed to MobileMD merger with Siemens. Soarian customers pleased with interoperability prospects. Recent entry into the HIE market through 2013 dbMotion acquisition. Strong product and vendor engagement. EMR agnostic. Good usability. Valued for care coordination and analytics, but most customers not there yet. Good satisfaction from early users, mainly public HIEs. Standards based. Strong connectivity for basic exchange. Road map for expanded capabilities not well understood. A service-oriented vendor. Highly rated by early users. Technical excellence plus good service. Background in interfacing very helpful, including timely interface delivery. HealthShare Analytics is on customers’ road maps. Declining satisfaction. Works well with NextGen, but weak sharing with other vendors. Lacks development focus; progress needed to fill functionality gaps. New strategy awaited post Mirth acquisition.